For more than half a century, oceanographers have ventured out of Newport to measure, probe and monitor the Pacific Ocean off the central Oregon Coast. And since the 1950s, these seafaring researchers have recorded about 4,000 “profiles” of the near-shore waters — surface to bottom measurements of temperature, salinity and oxygen levels that begin to tell us how the world’s largest ocean influences everything from our weather to fisheries. Then in 2005, Oregon State University scientists tested a prototype undersea glider that could be programmed to patrol beneath the ocean surface and collect many of the same measurements. At the time, the scientists predicted that these gliders could revolutionize the study of the world’s oceans. Their vision is rapidly becoming a reality. In the past five years, a fleet of gliders operated by OSU’s College of Oceanic and Atmospheric Sciences has covered more than 43,000 kilometers, a distance that would more than circumnavigate the globe. Even more striking is the productivity of the sleek, torpedo-like machines. In those five years, the gliders have recorded more than 156,000 oceanic profiles, almost 40 times what six decades of shipboard studies have provided. Underwater vehicles are not new to research, but the autonomous gliders used by OSU differ from earlier versions because they lack tethers or propellers — meaning they don’t have to be accompanied by a ship. The gliders instead are driven by buoyancy changes, which lessen the overall energy consumption. By displacing seawater, the gliders increase their volume and become more buoyant. Or they can decrease their volume and become heavier, sinking lower in the water. Small wings on the gliders translate some of that vertical motion into forward motion. The machines can be programmed to run for three to five weeks, from near-shore to the continental slope, and every six hours they rise to the surface and transmit data to OSU computers via satellite. The data they collect informs scientists on conditions including El Niño and La Niña, hypoxia (low oxygen) and resulting “dead zones” and harmful algal blooms. Barth and fellow OSU oceanographer Kipp Shearman, together with their team of faculty research assistants and graduate students, operate a fleet of nine gliders. Six are Slocum gliders, manufactured by Teledyne Webb Research of Falmouth, Massachusetts, and based on the original prototype tested in 2005. Three are new Seagliders developed at the University of Washington. The Slocums can go as deep as 200 meters below the surface; the newer Seagliders can explore the ocean down to 1,000 meters and stay out for months. Each glider costs between $100,000 and $200,000, so the OSU fleet is an impressive resource that is about to get much better. Three years ago, OSU was selected as one of the lead institutions for the $387 million Ocean Observatories Initiative, a National Science Foundation-funded project to study the world’s oceans and their relationship to climate variability. One component of that project is to create a coastal observatory off the Northwest coast that will use moorings, buoys and gliders to better observe and monitor the ocean. While engineers are still designing the hardware and instrumentation for the moorings, OSU in 2012 will deploy six new gliders — plus an additional half-dozen gliders on shore to be rotated into the observation array — bringing the total fleet to 21. And the new gliders will include instrumentation that has piqued the interest of ecologists, the fishing industry and others. Data from the Ocean Observatories Initiative will be available as they are being collected and shared with researchers and the public alike. 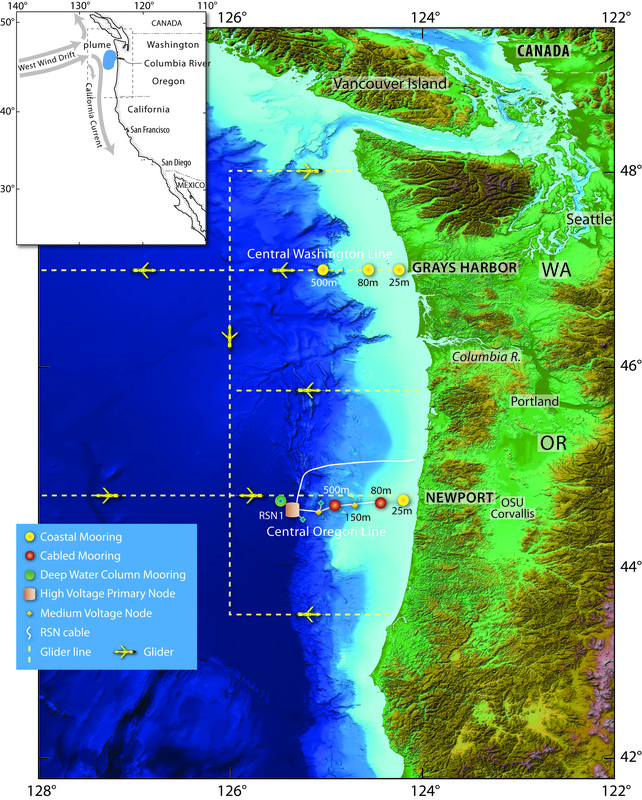 OSU’s fleet of 21 gliders will enable Barth, Shearman, scientific colleagues and the public to continually monitor five east-west transects — off the northwest tip of Washington, Gray’s Harbor, Cape Mears, Newport, and Coos Bay — while rotating the machines for calibration, maintenance and battery charging. The newest gliders will allow them to run a north-south pattern about 150 kilometers off the coast and, with separate NOAA funding, begin a new east-west transect off Crescent City, California. “We’ve been doing the Newport sector for five years now,” Barth says, “and we’ve seen things we’ve never seen before, from the influence of coastal rivers, to details about hypoxia. It’s become one of the most well-studied ocean regions on Earth. Now we’ll be able to get similar coverage up and down the coast, from the California border to Vancouver Island. See a March 23, 2011 story about deployment of new Ocean Observatories Initiative buoys off Newport, Ore. and Grays Harbor, Wash. The data and imaging gathered by the OSU/COAS Glider Research Group would be extremely helpful for the research I’m conducting as an undergraduate at Oregon State University. Can you suggest how I may obtain these images and data?